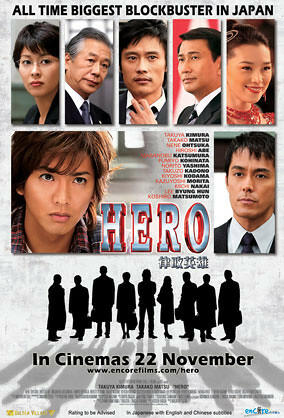 Last month, I went to Plaza Singapura Golden Village to watch "Hero", starred by Takuya Kimura with Karen... This movie moves on from the 2-hr tv special which Mediacorp specially broadcast recently (and i happened to be at home to watch that day.. Yay!! ), thus if you didnt watch it, you may not understand some scenes.. This movie even went to Korea for some filming and featured Lee Byung Hun (handsome!!) in some of the scenes.. It was funny to see the movie start off like a tv drama on the big screen, with introduction of actors and actresses in the big big way.. but I guess that is what it is, a tv drama that went on to something bigger..